Plants perennial. Culms 30-100 cm, usually decumbent, sometimes erect. 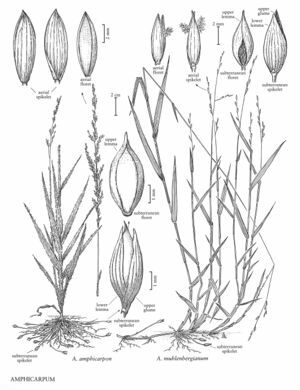 Leaves evenly distributed; sheaths usually glabrous, occasionally sparsely hirsute; blades to 10(13) cm long, 5-10.5 mm wide, glabrous, margins white. Subterranean spikelets 6-9 mm, acuminate. Aerial panicles 3-20 cm; aerial spikelets 5.5-7 mm, narrowly lanceoloidal. 2n = 18. Amphicarpum muhlenbergianum grows in damp areas, such as dried pond bottoms, ditches, flatwoods, and swampy pinewoods of the southeastern United States.